To food you need alcohol. 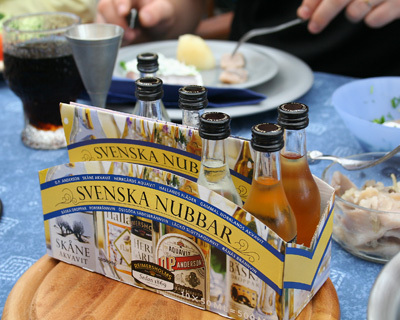 Every country have their "own" alcohol but Sweden don't. As with everything else nothing is typical swedish. Still there are a few sorts of alcohol that are drinked more often then others. Before I tell you about those I have to tell you that Alfie has made the first comment on this blog :). I've told you about midsummer, christmas and other traditions. To every tradition that means food you need snaps and drinking songs. That's swedish. Does it taste good? No, but that's not the point. You get drunk without drinking a disgusting drink in three hours. Typical swedish not wasting any time on getting drunk or pretend that something's better then it's. For the enjoying part we drink beer. A lot of it. It's good and relaxing. In Sweden we have one company and one company only that are allowed to sell drinks containing more then 3.5% alcohol. And you have to be 20. Still you get to drink alcohol on the pub's when your 18. This because it's dangerous to drink at home when your 18, but on the pub's there are guards how look after you. Then when your 20 you responsible enough to drink at home. According to the swedish government. Still the criminal has been affected by alcohol in almost every reported violence crime. So don't forget to drink beer and snaps when you visit Sweden :). Swedish don't have any national dishes. But we have one meal that includes all of our specialties. One part of it is the meatball. The good meatball. Made of meat (dah?! ), onion, egg, milk and some spices. The home made are the best one, the one mother does is the greatest. To the meatball you should have potato or potato mash. Home made potato mash is the favourite. Again mother's is the best. To this you need sauce. Actually swedish want's sauce to everything me eat. Ketchup do not count as sauce. Without sauce nothing is good. The sauce makes everything just a little bit better. And thats the meal and the only specialties we have (apart from some disgusting things that I won't even mention), add some sour pickled gherkin and lingonberry preserve and it's perfect. Good, easy to do. 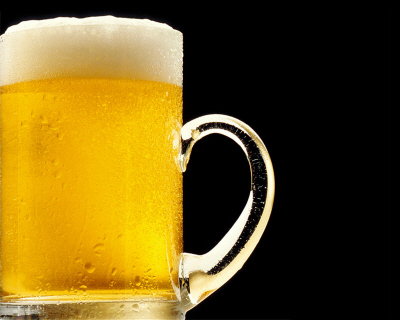 Have some beer and enjoy! Didn't find any picture that looked nice, so you'll have to survive a picture less contribution :(. Hi :). I thought we start this food week with a contribution about two bakery that are very common in Sweden. The cream bun and the cinnamon bun. Both has a special day in Sweden and today is the cream buns day or as is called in Sweden "semla" (but it has many other namnes to). 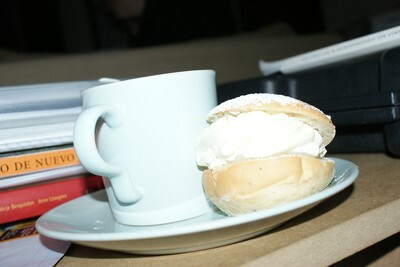 Semlan is a wheat bun with cardamom. In the bun there are cream and marzipan, really dealicous. Semlan is an old bakery and from the beginning you ate it before the fast. That's why the "Fettisdagen" is in this time of the year. Some people eat it with milk, since that was how you ate it in the old days. How it looks and what it's called depends on were in Sweden you're. But must comon is that it looks just like the one in picture above. 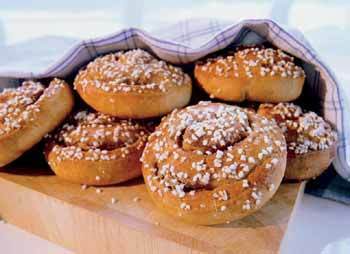 The other bakery that has it's on special day is the cinnamon bun, or as is name in Sweden "kanelbulle". This bakery is also a wheat bun, but not in a bun form. In the between the "layers"you have cinnamon and sugar. Today it's popular to trade out the cinnamon to vanilia. I have no idea why it's so popular here or were it's actually from. Try google it ;).